Eye View – Looking Forward… Not Back For those of you still on the Algarve or basking in the steamy heat of Marbella or Mallorca, your problems are more likely to revolve around the persistent humidity and the cost of air conditioning. Or how you’re going to wean yourself off the booze once you’re back in God’s own country. For those of us already sobered up, cooled down and back in harness amidst the fresh breezes of Northern Ireland/the North of Ireland* (*delete as appropriate), thoughts are already turning to the prospect of breaking the political stalemate. But not too many thoughts, it has to be said, as most of our politicians are either off on holiday or hanging around and only making the odd polo-shirted appearance on TV. The only player left in a suit and tie, it seems, is the hapless James Brokenshire, dispatched to the good ole US of A to talk trade alongside Liam Fox (…..more of which later). And the SoS has already made it very clear that there won’t be anything much happening until the summer is out. That presumably means the start of September. So we’ll have to kick our heels and wait. Not something we’re unfamiliar with. There have been few sightings of Arlene or Michelle since summer kicked in with its mercifully peaceful marching season. But there have been hopeful signs… oh yes, there have! Take the case of Edwin Poots. Always affable in person and a competent politician, Pootsie is portrayed as an extreme example of the DUP breed by the media. One couldn’t have imagined him ever venturing over the border. Yet, there he was, not long after the Twelfth, in the Donegal village of Glenties of all places, where he was a speaker at the annual MacGill Summer School. It’s profound and it’s also very true. Surely that’s progress. Isn’t it? But there’s another side to every coin. While we’re getting our hopes up over Pootsie’s Irish and Arlene’s positive comments, one of our more respected commentators has been urinating all over our parade…. and everyone else’s for that matter. Brian Rowan, admittedly a man who knows a thing or two about what goes on behind the scenes, reckons that the signs aren’t good. Thanks for that, Brian. There’s no evidence, he says, that the DUP and Sinn Fein got close to a deal in the several phases of talks so far. And he reckons that there is no room, no place, for some half-hearted agreement…. a patch up to have political institutions for the sake of having them. Fair enough. We’ll give you that one. But he goes on to bluster that ‘the past keeps tripping up the present’. And so, his argument goes, perhaps the focus should be on that past. He suggests a ‘past process’ rather than any other kind of process and adds that, before there is any new Executive or Assembly, the issues of the past need to be addressed. Oh spare us, Brian, please spare us! What is there about political commentators that they all turn out, in the end, to be indefatigable weary willies. For heaven’s sake, let’s move on. And a little optimism, just a little, might go a long way. The ever-diminishing band of Brexit cheerleaders have been clutching at straws again this week, leaping joyfully onto the news that BMW’s Mini plant in Oxford had won the contract to build the new electric Mini… ahead of a plant in the Netherlands. Liam Fox, over in Washingtom with little Captain Brokenshire (amongst others) was positively ecstatic in that irritatingly condescending manner that he has. And the biggest Tory cheerleader of the lot, Ian Paisley Jr., also took to social media to pump out the good news. Not that it has anyting to do with Northern Ireland, but that didn’t stop him. Meanwile, back at home, more than 80% of local firms represented at a recent Institute of Directors (IoD) Northern Ireland workshop say that they’ve considered setting up or expanding operations in the European Union to overcome concerns around Brexit. A survey of delegates found respondents rated trade and export their greatest concern, with 80% having considered dual location to ease trading with the EU. It also found that 40% were not at all prepared for Brexit, while 20% had started scenario planning and 33% were having Brexit-related discussions with customers and suppliers. So there you have it, Ian. Try talking to a few of your business constituents before celebrating the achievements of one English-based – but German-owned – car plant. If companies were school pupils, then the SHS Group would be one of those smug and irritating students who pops up every year come prize day in the summer. The company has been close to the top of the class since its relatively early days under Joe Sloan and the late Geoff Salters…and it hasn’t slackened the pace since. Just this week, it added another acquisition, snapping up Standard Brands (UK) Ltd, the company behind Zip and Sunny Jim firelighters and associated products. The deal means that our best-known ‘ignition’ brands join SHS’s portfolio of premium brands under its ownership… from WKD and Merrydown Cider to Schloer, Bottlegreen and Maguire & Paterson matches (also an ignition brand, one presumes). Standard Brands has a sales office in Surrey and manufacturing operations in County Louth. It’s 110 staff will bring the SHS total to more than 880. Richard Gray and his corporate team at Carson McDowell advised SHS Group on the more recent deal. And, when it comes to any SHS barbeques this summer, they should have no problems getting the charcoal to light…..! Unless they’ve over indulged in the WKD, that is. We know how keen you all are on five-a-side football. Who doesn’t relish the opportunity, after all, to sustain a spot of serious knee damage and/or a few bruises here and there in the heat of battle? And, rather more sensibly, who doesn’t fancy the handy excuse that five-a-side offers for a few pints afterwards? So here’s your chance. Telecomms firm Onecom has partnered with the Irish Football Association to launch the inaugural Onecom Business League. It kicks off on Tuesday, 29th August, at Playball, Stormont (the Civil Service sports complex) and 24 teams will compete for silverware – as footballers like to call it – and the chance to train with Northern Ireland’s coaches. Teams can name a squad of up to ten players to compete in the 14-week league. The competition finishes in a tournament final which will include a celebration and business networking event at the National Stadium, Windsor Park. “We are delighted to partner with the Irish FA to start our football league. It is well known that Northern Ireland has world class talent both on the pitch and in the boardroom. We will bring these two worlds together and create a new element of competition between some of our top businesses,” says Paul Lawther, Head of Onecom in Northern Ireland. Indeed. Cynics might say that the term ‘world class’ might be stretching it just a bit, Paul, but we’ll see. June seems like a distant memory now but these high-end videos take a while to craft, you know. One can’t just rattle them out in an instant. So here’s a little reminder, for those who were with us, and a record for those who weren’t, of the 2017 BEFTA’s (the Business Eye First Trust Bank Small Business Awards) held at the Crowne Plaza Belfast. 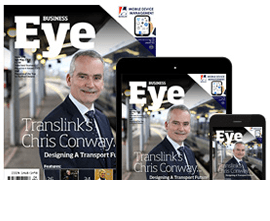 August sees the publication of the annual Business Eye Profit 200 special edition, sponsored once again this year by our friends at Danske Bank. Even if we say so ourselves, it’s the best opportunity you’re going to have this year to reach a dedicated business audience via Northern Ireland’s leading business magazine. It used to be well nigh impossible to get a tee off time to play on the hallowed turf of Royal Portrush, venue for the 2019 Open Championship. But times have changed in the world of golf, as they have everywhere else. Now, thanks to a partnership between Royal Portrush and GolfNow, visitors can book a round on the Valley or Dunluce links online via the internet, mobile phone or app. A Belfast-based operation, GolfNow is owned by the US-based Golf Channel, and opened an office this summer at City Quays in the city, from where its team books tee times at courses all over Ireland. Last year, it reported an impressive 33% increase in tee time bookings, generating green fee revenue of well over half a million pounds for more than 230 different courses. Founded in 2001 with headquarters in Orlando, USA, GolfNow operates in more than 16 countries and provides tee-time access to more than 9,000 courses for more than 3.5 million registered users worldwide. The original local forerunner, BRS Golf, was founded in 1995 by Northern Ireland golf fanatics and IT experts Brian and Rory Smith, and was acquired by GolfNow in June 2013. Finally, it seems like a long time ago now, but we had a fantastic day at the Dubai Duty Free Irish Open at the wonderful Portstewart course just before heading off on holiday (….hence the delay in mentioning it). We were fortunate to be in the well-appointed surroundings of the Causeway Club hospitality suite courtesy of the generous and hospitable Katy Best of George Best Belfast City Airport, but what was clear was that everyone (hospitality or no hospitality) was really enjoying the event. The local hopefuls, including host Rory McIlroy, didn’t do so well, but that didn’t take away from an event which, to our relatively untrained eye, seemed to be really well organised, well run yet accessible and affordable. Judging by the familiar faces we met in the marquee and out on the course, there weren’t too many at their desks back in Belfast on the Friday of the Open. It all augurs really well for the big one – the Open Championship itself – due to be staged just up the road at Royal Portrush from July 18-21 in 2019.